At the invitation of the Octavia Hill Society, our immediate Past Chairman Peter Chester travelled to Wisbech in December with his wife Heather and our President Shirley Preece. The occasion was a Service of Thanksgiving and Commemoration for the life of Octavia Hill. Peter was invited to read the lesson at the Service in Wisbech Parish Church and the keynote speech to members was delivered by David Bellamy, OBE. Our party also took the opportunity to visit the Octavia Hill Museum, which was her birthplace and occupies a prominent site in the historic core of Wisbech. The Museum proved fascinating, especially the John Kyrle Room which provides the strong link with Ross. Apart from her pioneering work with the founding of the National Trust, Octavia Hill was a prominent social reformer much concerned with improving the living standards of the under-privileged. 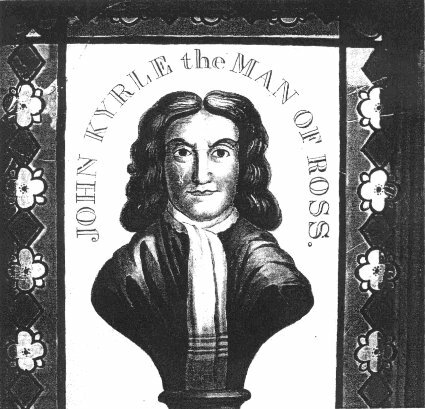 She drew much of her inspiration from the work and writings of John Kyrle and the room dedicated to him contains much of interest to the visitor from Ross, not least the stained-glass window which is a treasured possession of the Museum (see illustration overleaf). It is interesting to note that Octavia Hill's Kyrle Society, founded in 1877, eventually had branches in many provincial towns and was the forerunner of all the Civic Societies. Members of the Octavia Hill Society have visited Ross on a number of occasions, including the recent planting of a commemorative rose bush at the Prospect where we were represented by Eileen Sprayson. The Society's Chairman is very keen to develop a stronger relationship with Ross, especially through the newly established and close links with the Civic Society. During discussions, the possibility was mooted of a visit to the Museum with perhaps a dinner and overnight stay so that members might see something of this little known but interesting part of East Anglia, with a landscape and styles of architecture so different from our own. The feasibility of this idea will be considered by the Events Subcommittee but members who would welcome it might indicate to this effect so that we may gauge the potential take-up.